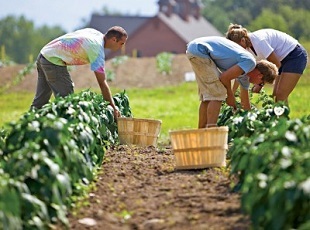 What is Organic Farming? Organic farming is an agricultural method that reduces or elimiates reliance on the use of chemicals. Specifically it relies on techniques such as crop rotations, composting, soil improvement, green manuring and pest control strategies. Organic produce is increasing in popularity due to concerns of chemical residues on food for consumption and the uncertain environmental effects and cost of wide scale chemical spraying used in traditional agriculture. Sustainable farming practices are needed to ensure a future in global agriculture and organic methods are central to solutions being pursued by many farms. This course aims to give you an foundation in organic farming with the exploration of organics, certification and the commonly used practicals skills and strategies required to move towards organic crop production. Discuss the scope and nature of organic farming in today’s world. Select appropriate organic management systems for different organic farms. Understand the environmental, economic and political issues concerning organic farming. Explain the role of living organisms and decomposing organic matter in creating and maintaining an appropriate soil condition for successful organic farming. Contrive and apply appropriate weed management practices for an organic farm. Design an appropriate system for organic production of cattle, sheep and pigs. Design an appropriate system for organic production of poultry and other miscellaneous animals. Design an appropriate system for organic pasture management. Explain the broad-acre organic production of a grain or legume crop.